As befitting a knight and a Beatle, McCartney took the stage first. 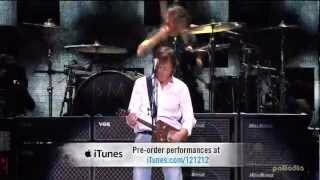 Sir Paul may be way past 64 at this point, but close your eyes while he’s rocking and you’d be hard pressed to notice it. McCartney’s soundcheck was almost a mini-concert: He joked around with his crew, brought some awesomely special guests onstage (you’ll have to watch it to find out more!) and even lit up the pyrotechnics during his practice run. While we can’t tell you exactly what McCartney played, we might be able to let it slip that he played two songs from a certain self-titled Beatles album. He even delved deep into his catalog, delivering a non-single Wings track (it’s an underappreciated gem). Also, we would be remiss to mention he had not one but TWO lava lamps onstage. Krist Novoselic, Sir Paul McCartney, Dave Grohl, and Pat Smear perform at ’12-12-12′ a concert benefiting The Robin Hood Relief Fund to aid the victims of Hurricane Sandy presented by Clear Channel Media & Entertainment, The Madison Square Garden Company and The Weinstein Company at Madison Square Garden on December 12, 2012 in New York City. Sir Paul McCartney performs during the ’12-12-12′ concert benefiting The Robin Hood Relief Fund to aid the victims of Hurricane Sandy presented by Clear Channel Media & Entertainment, The Madison Square Garden Company and The Weinstein Company at Madison Square Garden on December 12, 2012 in New York City. Sir Paul McCartney performs at ’12-12-12′ a concert benefiting The Robin Hood Relief Fund to aid the victims of Hurricane Sandy presented by Clear Channel Media & Entertainment, The Madison Square Garden Company and The Weinstein Company at Madison Square Garden on December 12, 2012 in New York City. This was the 15th concert played at Madison Square Garden.